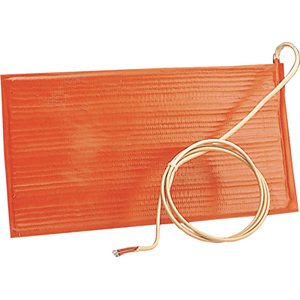 OMEGALUX™ silicone rubber laminated heating blankets are low watt density electrical resistance heaters in blanket form. They are designed for freeze protection as well as process temperature control applications. The rugged heater element is made from multi-strand braided and knitted wire. The vulcanized heater assembly is water tight. Optional pressure sensitive adhesive makes installation easy. Heat from the blanket itself cures the silicone adhesive, creating a permanent bond. SSHB-612-180-120 SSHB-612-180-120-P 120 180 6" x 12"
SSHB-612-180-240 SSHB-612-180-240-P 240 180 6" x 12"
SSHB-624-360-120 SSHB-624-360-120-P 120 360 6" x 24"
SSHB-624-360-240 SSHB-624-360-240-P 240 360 6" x 24"
SSHB-1212-360-120 SSHB-1212-360-120-P 120 360 12" x 12"
SSHB-1212-360-240 SSHB-1212-360-240-P 240 360 12" x 12"
SSHB-1224-720-120 SSHB-1224-720-120-P 120 720 12" x 24"
SSHB-1224-720-240 SSHB-1224-720-240-P 240 720 12" x 24"
SSHB-2424-1440-120 SSHB-2424-1440-120-P 120 1440 24" x 24"
SSHB-2424-1440-240 SSHB-2424-1440-240-P 240 1440 24" x 24"
참고: *Contact OMEGALUX for 480 V heaters.